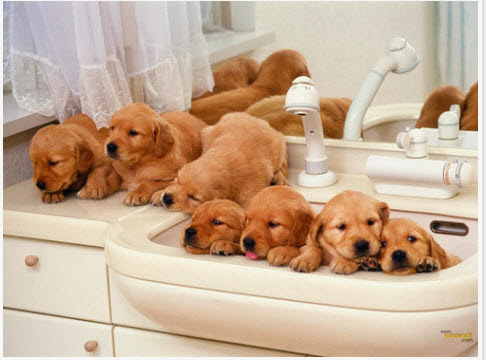 I did a double take when I saw these copper pot sinks. What a great idea! Such a fun conversation piece and so unique. 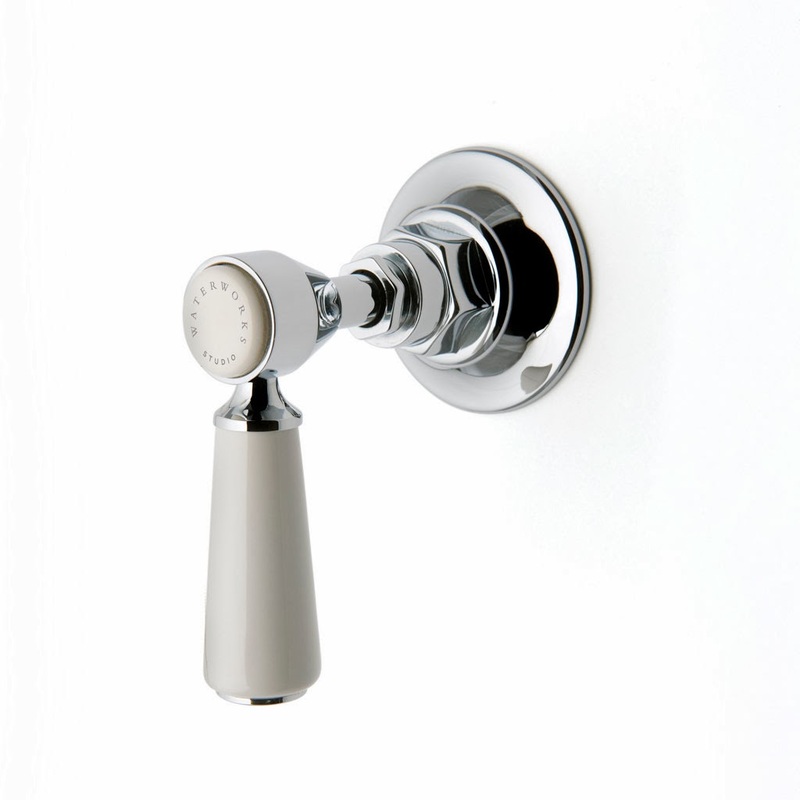 The handles on the sides of the pots are practical too, you can hang a hand towel off them. Crisp white hand towels would look great. 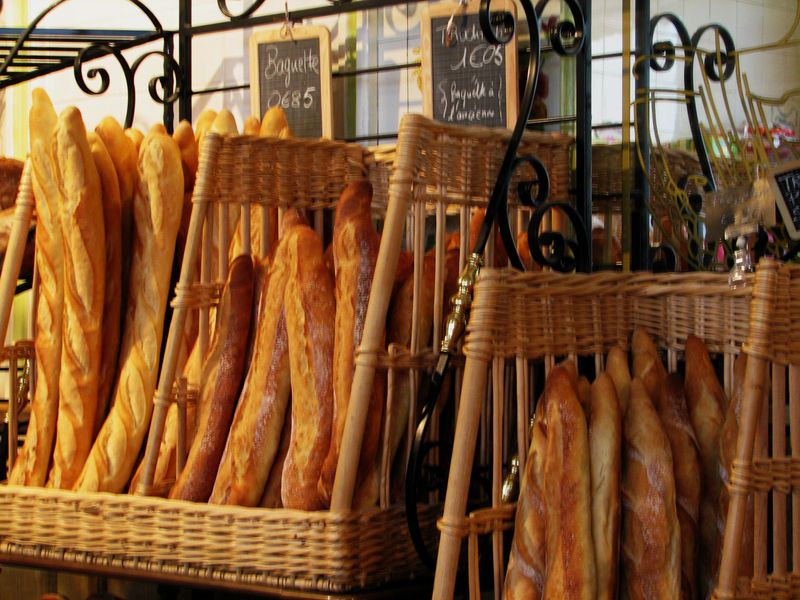 Towels with a fruit or vegetable motif or kitchen towels with vintage designs would also be fun to use. 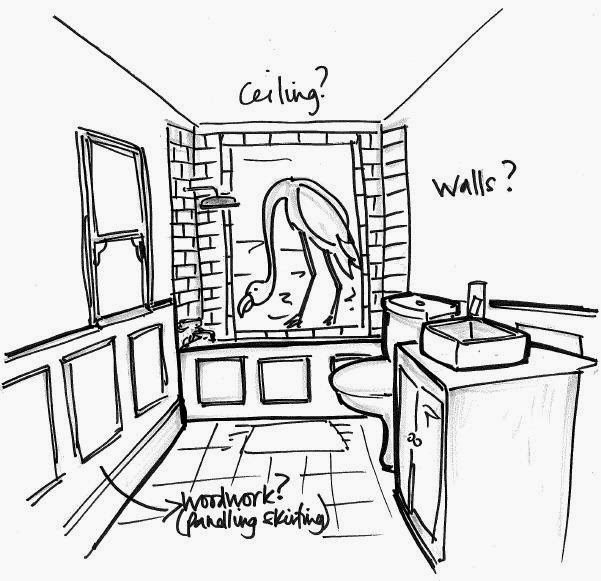 The only thing I would want to change in this bathroom is the white plastic piping. I think it would add to the design if they had put copper piping. These rectangular ones would hide the piping completely if faced backwards. You wouldn't get as much of the baguette basket feel with these, but I'm sure they would look nice too. 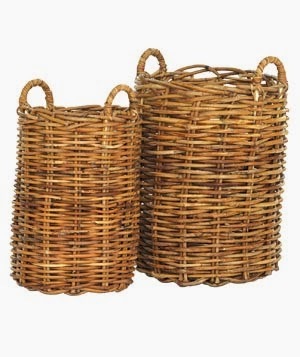 The weave of these baskets would look spectacular under the vanity. Maybe you'd have to cut them a bit to fit the piping which would be a pity because they are so pretty. fit around the plumbing and effectively hide it. 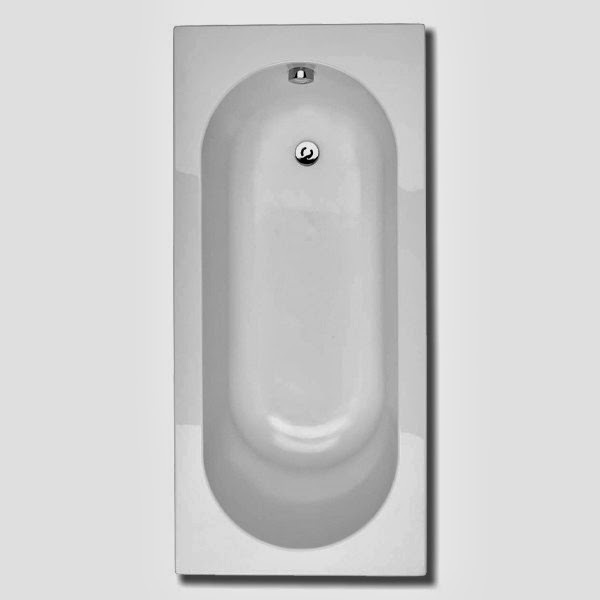 This tub base design makes me think of a coffee table in my aunt's apartment. When I was little I called it the cheese table. It's a small round wooden table with orange triangle shaped stools that are stored underneath. As a kid I used to like to take out all the stools and form them into their perfect little orange cheese wedge circle. It was one of my favorite things to do when visiting my aunt and uncle at their apartment, that and swimming in the indoor pool. 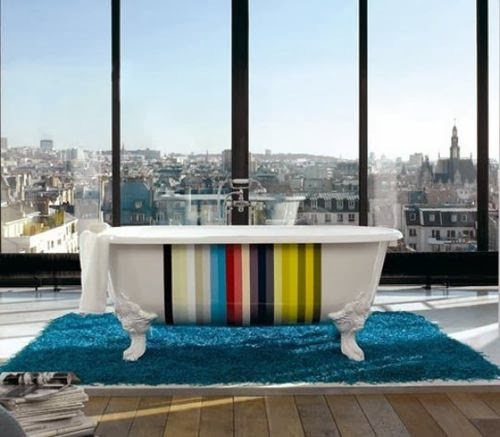 This bathtub design is very glamorous but still has a modern vibe. 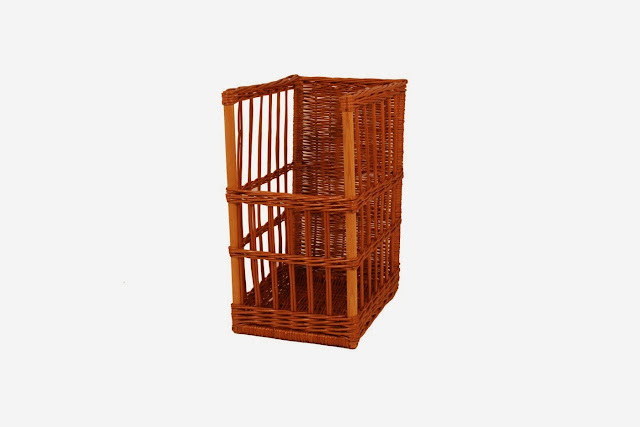 The pull out side table is a great detail, perfect to use as a bench to sit on while washing the dog or great to stack on some bottles of bubble bath, salts and bath time reading. 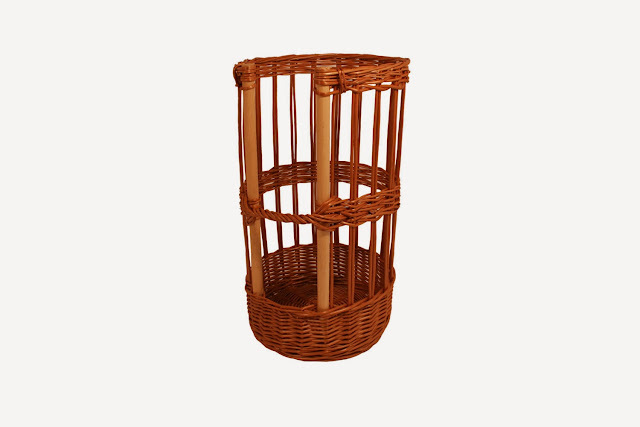 The wood looks like teak, which is pretty low maintenance. Was out doing some gift shopping when I stumbled upon this beauty. 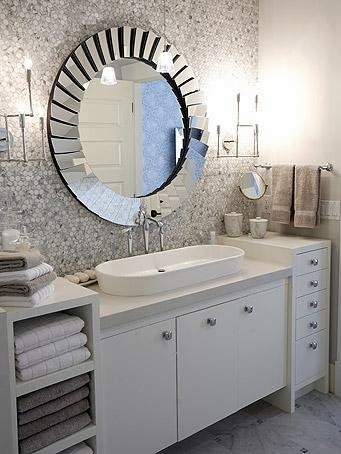 It is a very glam little mirrored vanity, wish I had a use for it or knew someone redoing their bathroom right now! It's such a great price for everything you get. It already includes the sink and faucets and the countertop is a delicious creamy stone so it would be a major score. What I like best about this vanity is that the feet are also mirrored, most of the time you see them covered in wood. 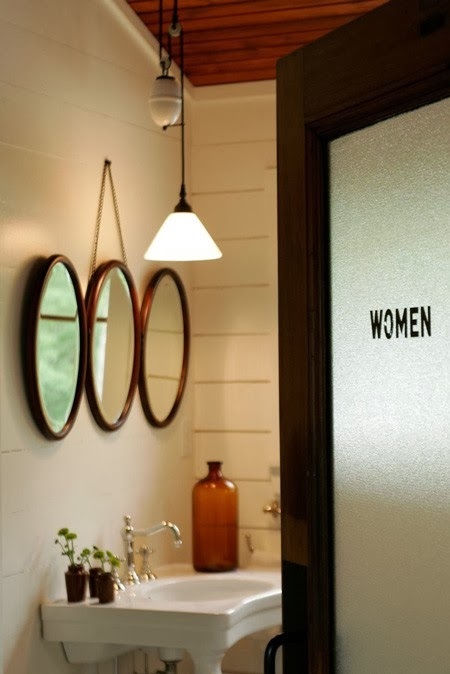 For sure the wood is more practical cleaning wise, but I just find the mirroring adds a nice little detail. I snapped some photos of the product info in case you want to track down one of these beauties for yourself. Here is the company's website: here. If any of you get one, please as usual send me some photos! 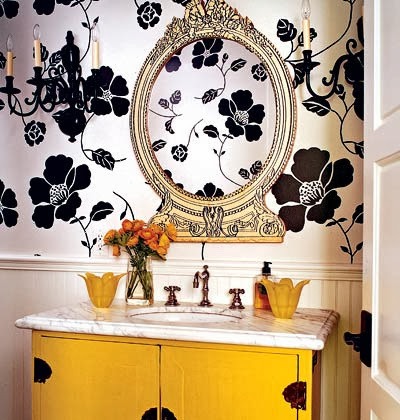 You know how I love a pretty vanity. Ack! this bunny is so cute! Now if I were Agnes from Despicable Me I'd be going nuts over this cutie.What an irresistible little face he's got. 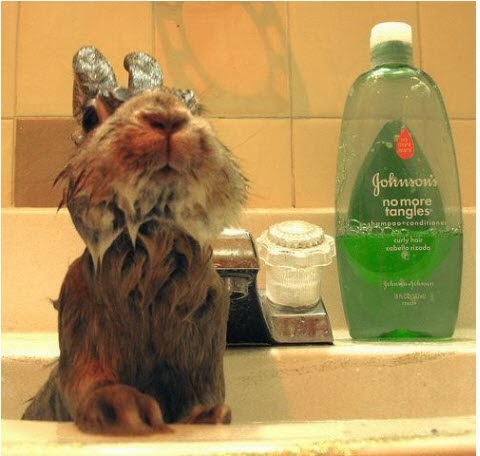 This bunny should be the little spokes model for Johnson's shampoos. I'm sure a photo of him on the bottle would increase their sales. Last week's tub with a view was also a Victorian style bathtub, it was a cool emerald green color and the setting was very moody, a great location to write a heart pounding thriller, but I think I like this one better. 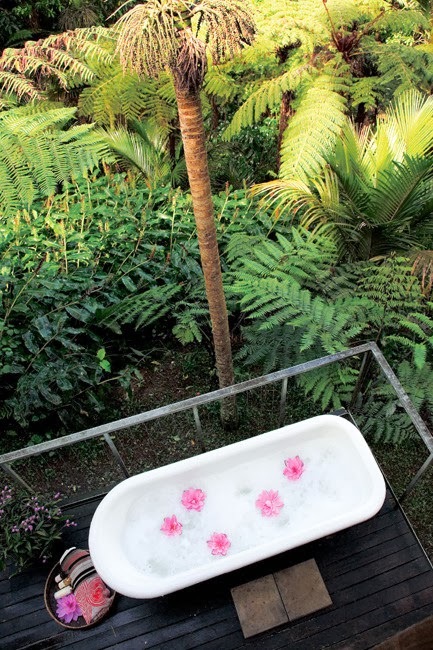 What type of novel would I write lying in this sudsy bubble bath with pink flowers and surrounded by palm trees? Hmm...I think it would start out with a couple arriving by private water plane to a posh tropical island surrounded by aqua blue water and the softest creamy white sands. Picture perfect until a butter knife is found in the back of the hottest waiter at the hilltop restaurant...or maybe I'd write a book about a cute little banana eating giraffe. 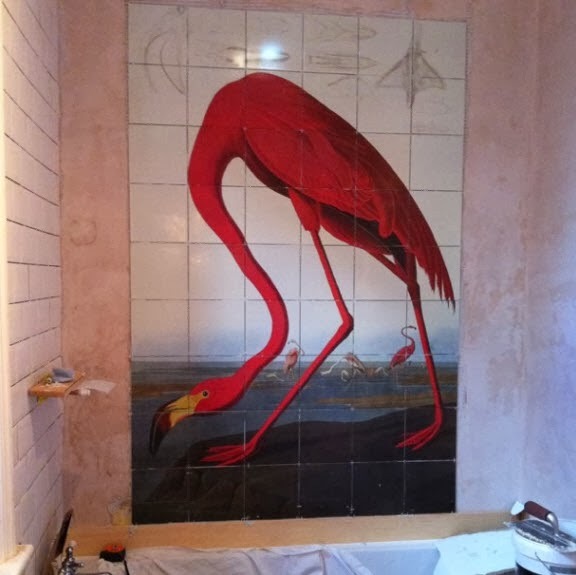 I love flamingos, I'm sure I've mentioned it a few dozen times already on this blog, but here I go again. I can't resist a sweet flamingo. 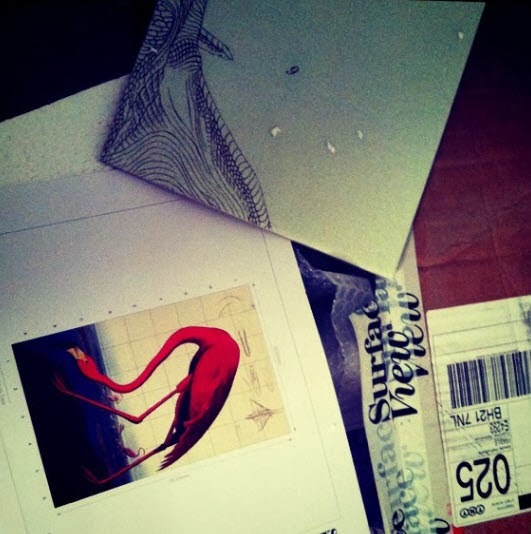 I've seen this flamingo art before in poster format in many décor magazines. He's often used in entrance ways. Yes, for some reason I always picture flamingos as males. Anyways, I think they did a fantastic job in this bathroom. 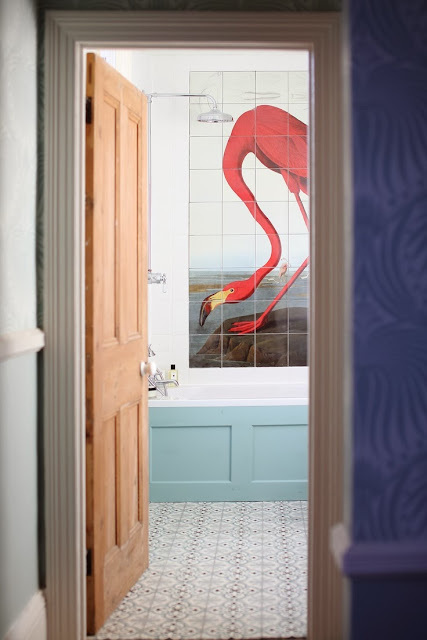 Of course Monsieur Flamingo is the star of the bathroom, but lets not overlook all the other great details in this small bathroom. I like how they went the extra mile and went with blue paint to accent the flamingo's hot pink hue. 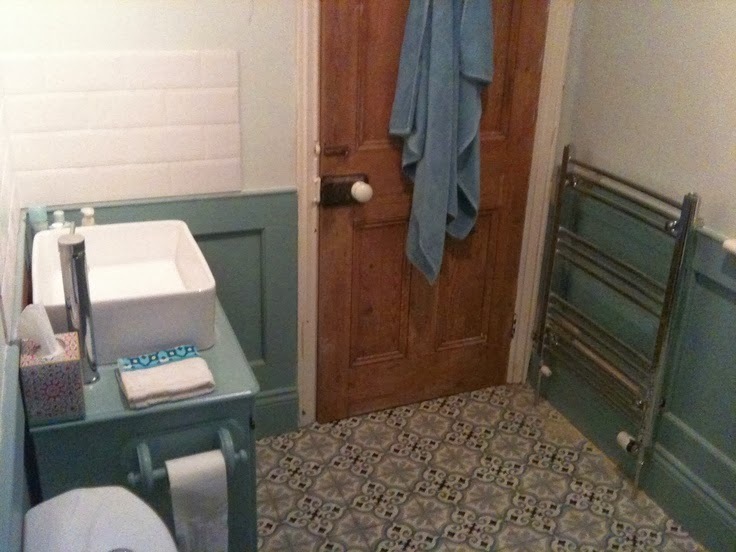 An all white bathroom would have worked too, but the blue just makes it extra special and ties in great with the blue in the floor tiles. 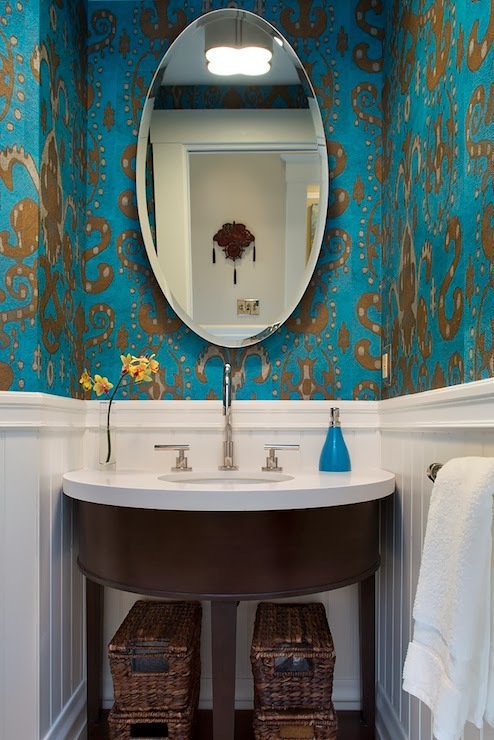 The blue paint used on the wainscoting, tub and vanity is Farrow & Balls Oval Room Blue No. 85. Per their site this shade of blue is "A typical late 18th, early 19th century colour which appears time and again in historic schemes." Here's the rest of the bathroom. I find the lighting in these photos make it look old and grungy. The blue paint looks green in these photos. 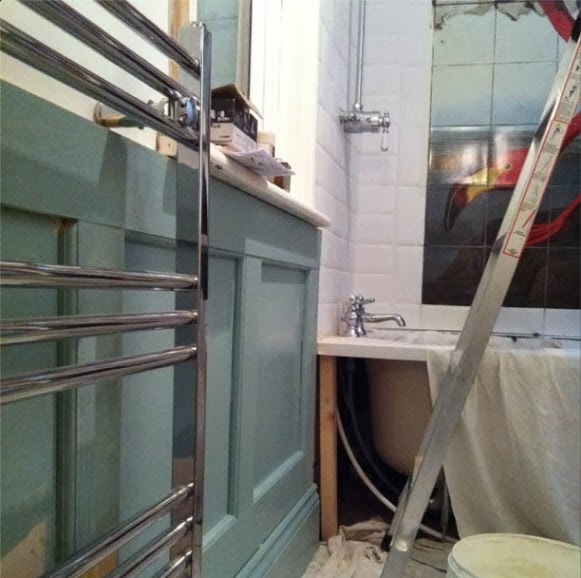 These pictures really don't do the bathroom justice, you'd never guess it was a brand new bathroom! 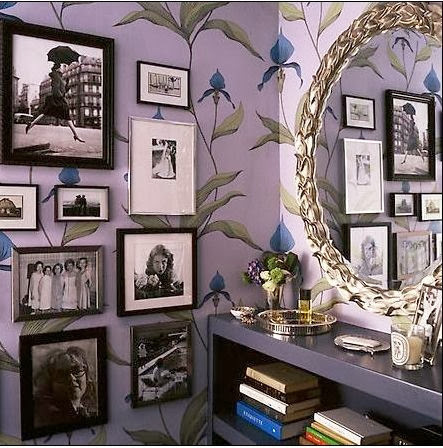 It just goes to show how poor lighting can make a fab room look drab. I always find it fun to look at the reno photos. 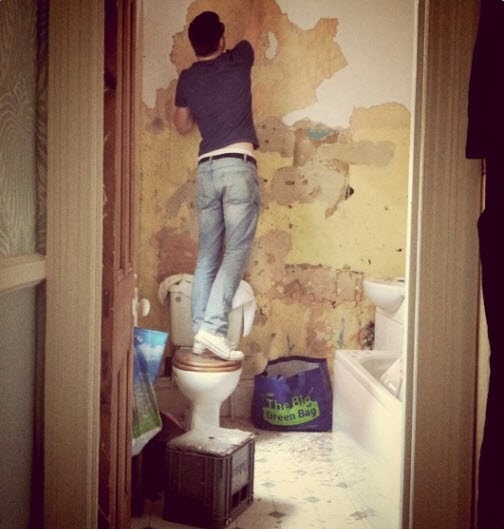 They give you a little sense of the amount of work that went into creating a great bathroom. 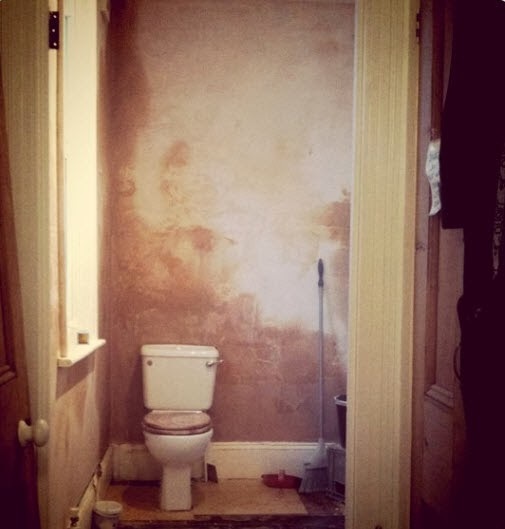 The bathrooms don't always start out as beautiful clean blank canvases! Fresh clean plastered walls ready to go. 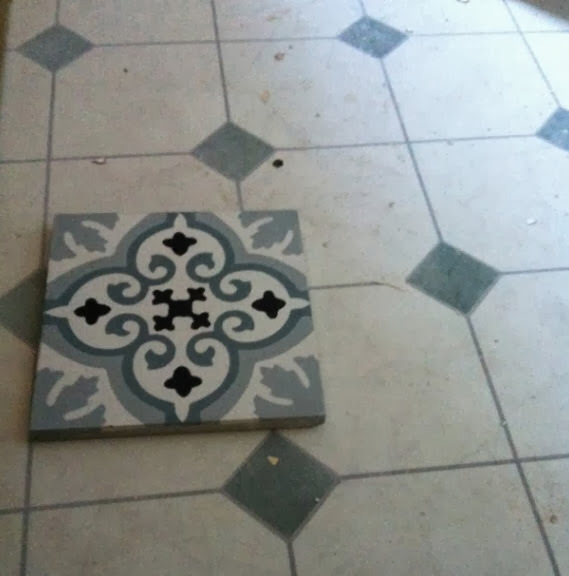 Picking the perfect tiles to replace this well worn floor. 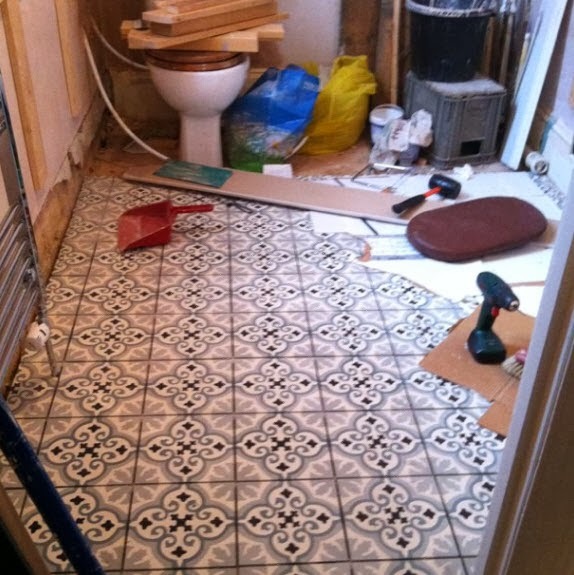 New floor tiles almost all installed. 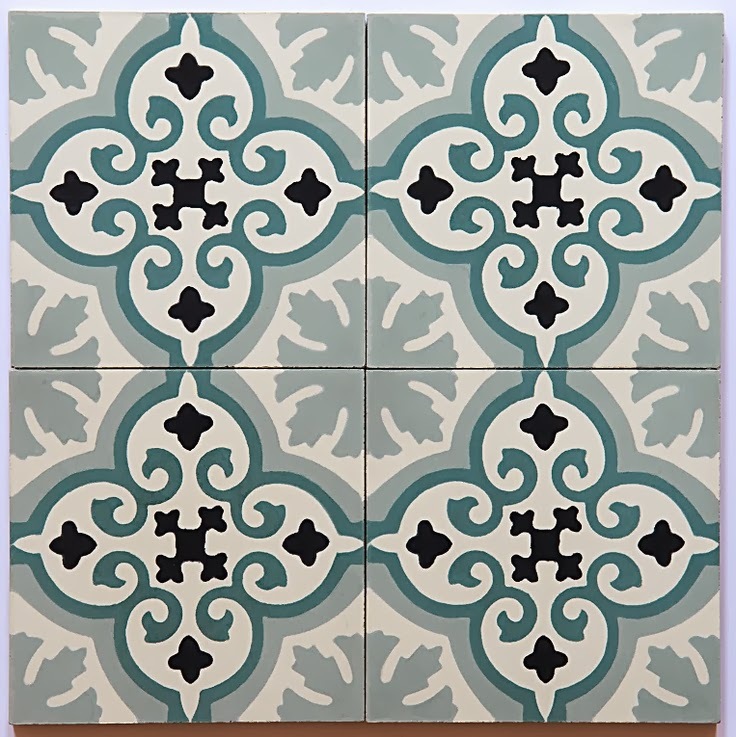 Here's a close up of these gorgeous tiles. 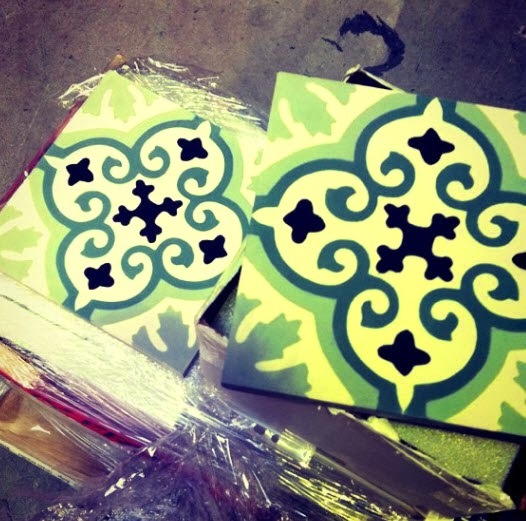 They are from Rebecca Hayes, they are Cement Encaustic tiles and it is the Siesta pattern. They are available here. "These tiles are a modern twist on the traditional Moroccan patterned tiles." 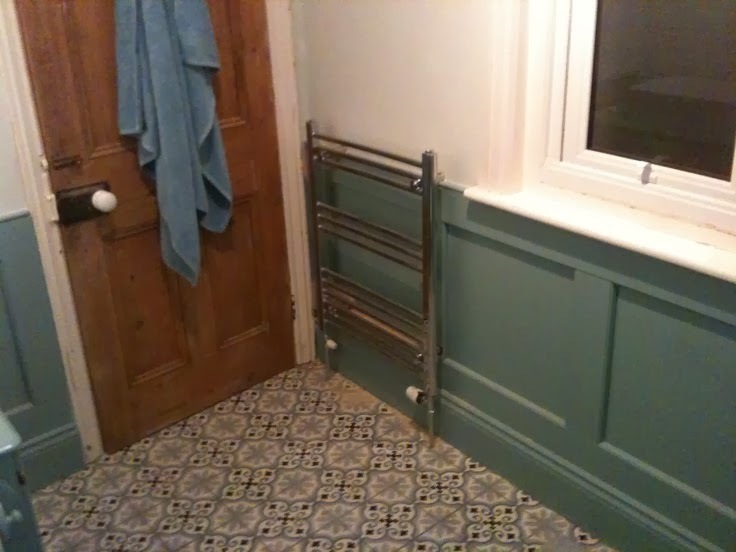 I've never heard of cement encaustic tiles before. I've seen them a few times, but didn't know their name. I learnt something new today. 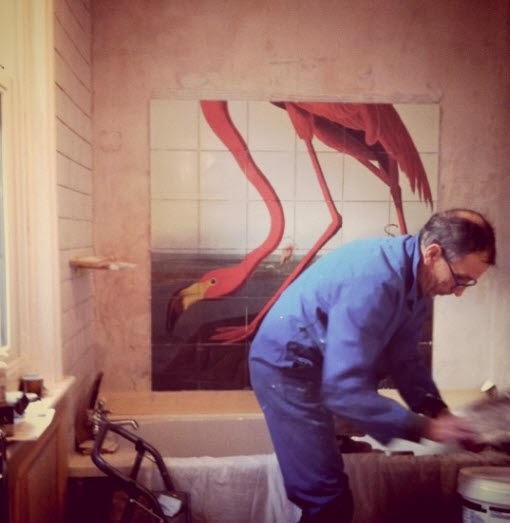 Getting ready to install the Flamingo tile mural. Now do you start from the top or the bottom? 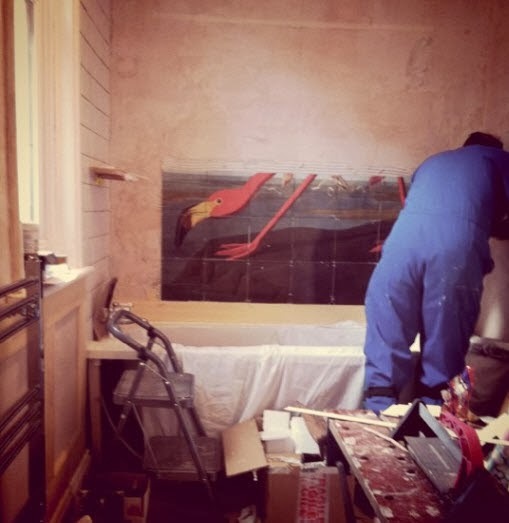 And the last step: painting the walls. 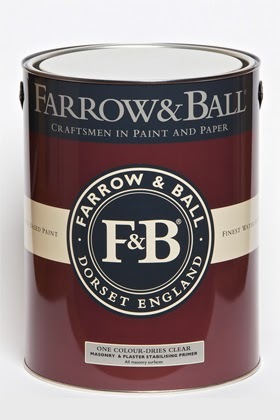 I read that the walls were painted in Farrow & Ball's Pale Powder Estate Emulsion. However, when I went on Farrow & Ball's site, I couldn't find that color. 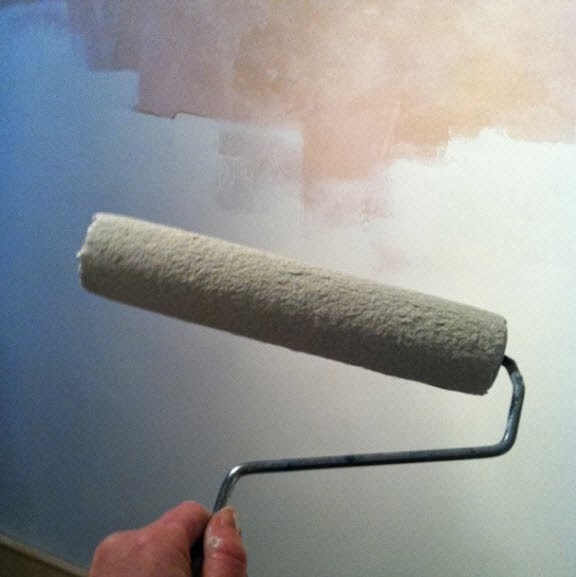 I did find a "Pale Powder" color. Pale Powder looks like this swatch bellow, so I don't think it matches the white color on the walls we see in the photos. 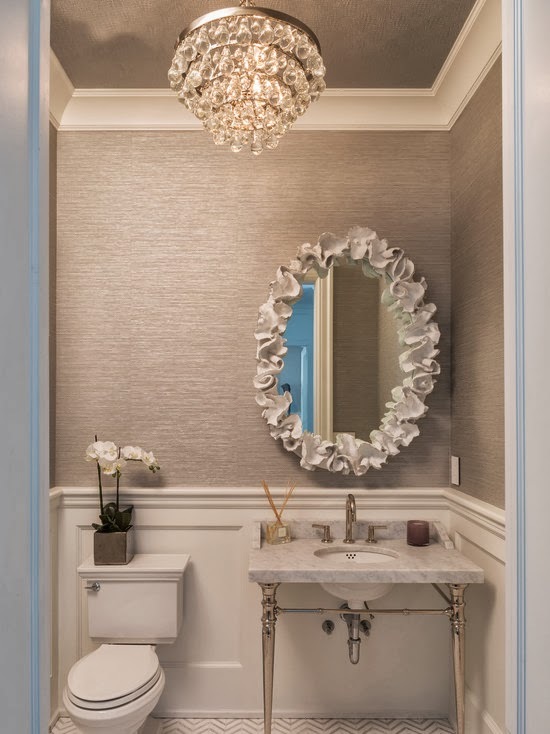 Also, the color swatch photo bellow from Farrow and Ball's website is suppose to be the Oval Room Blue paint color used on all the wood panelling. It looks completely different then the color in the bathroom photos. This swatch looks grey green to me. It just goes to show how different a color sample can look online versus a photo of the paint in use. Never in a million years would I guess this color swatch was for the wainscoting and woodwork in this bathroom. Who ever owns this bathroom is one lucky duckie, I mean one lucky flamingo. Bathroom wall paint color: Pale Powder Estate Emulsion on wall (as mentioned above, I was unable to find this color on Farrow & Ball's website). I couldn't find the shower system either. 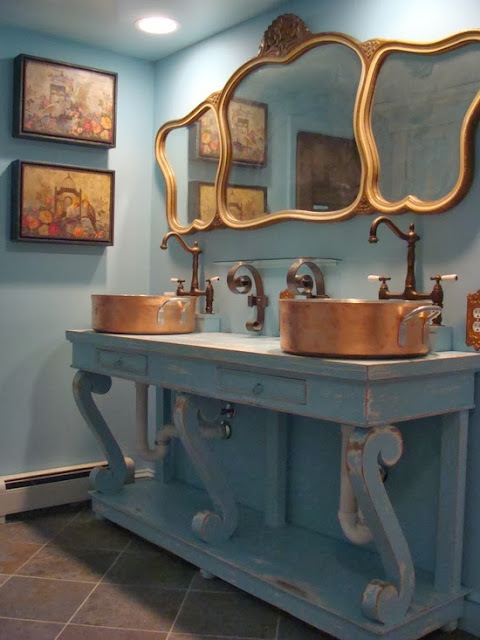 I think this one from Waterworks has the same traditional look and feel of the one in the flamingo bathroom. I don't think the style of the bathtub and shower fixtures match very well with the sink faucet. 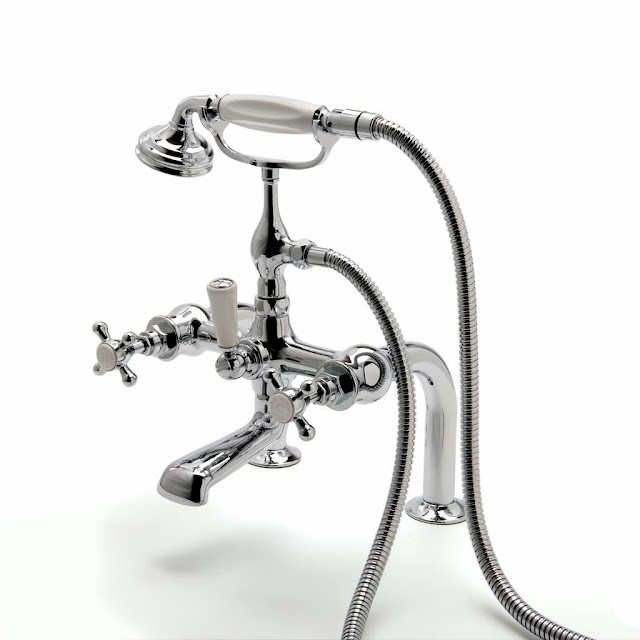 The sink faucet is contemporary in style while the bath fixtures are traditional. 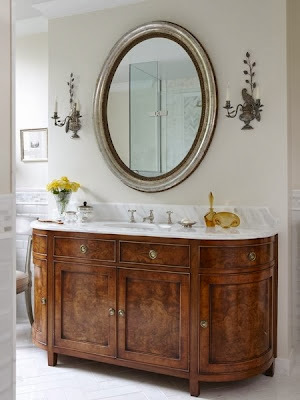 Especially since it is a small bathroom and the tub and vanity are so close to each other I would have gone with fixtures of the same style, either all traditional or all contemporary. Go back and look at the design of the sink faucet (the photo of the sink faucet is just above. 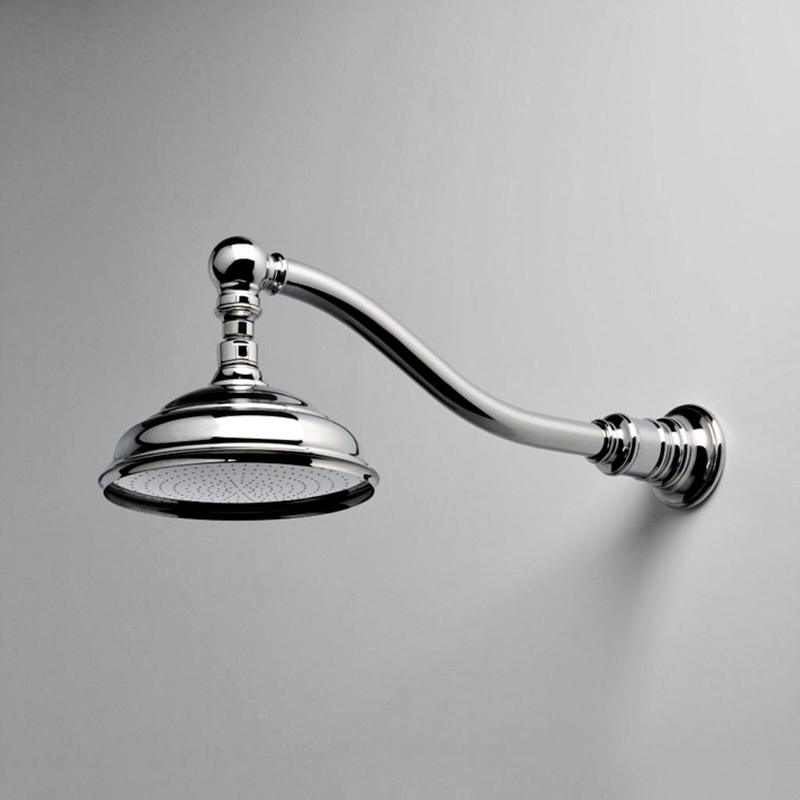 Unfortunately we don't have a head on shot of it in the bathroom pictures) and compare it with the style of the tub faucet and rainshower, do they look at all alike? Ummmm NO! 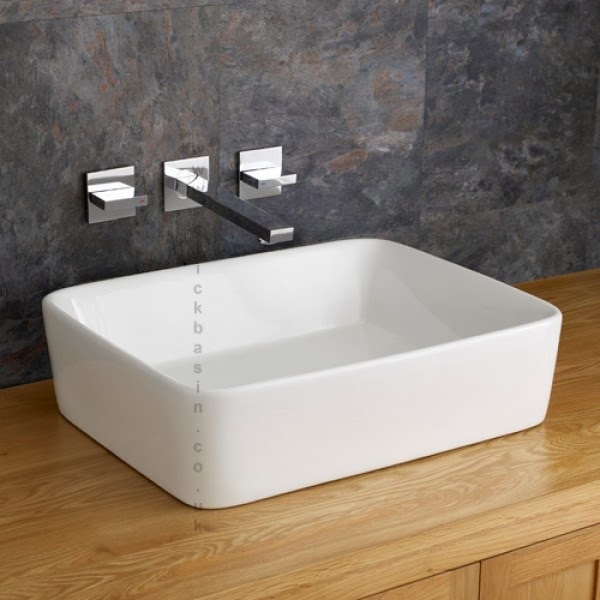 It's like the modern sink faucet is hanging out with the traditional bath faucets. Not good. 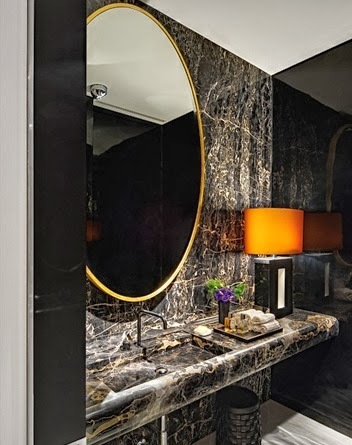 When it comes to fixtures in the bathroom, in my opinion, if you have a separate shower you can get away with using a different brand of fixture, but is should still be in the same style ie. modern, traditional or contemporary. 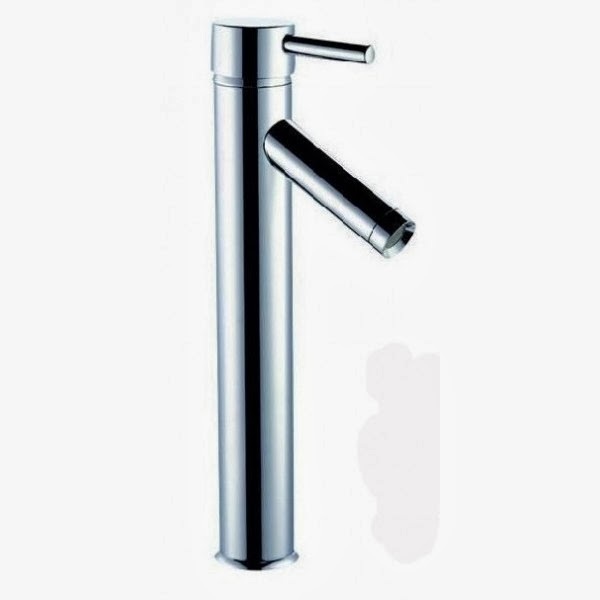 Plus, I'd keep all the faucets in the same brand and style ex. Waterworks Highgate sink faucet paired with a Waterworks Highgate tub faucet and as mentioned, if there was a separate glass shower I'd stick with a traditional style shower system to match with the look of the traditional Highgate faucets. Otherwise it tends to look very mismatched, like you only replaced half your fixtures or you bought them on sale and didn't care if they went together or not. If you're spending money on renovating your bathroom, don't skimp, take the time to match your faucets, these details make a big difference. I'm also wondering what they did for a shower curtain. 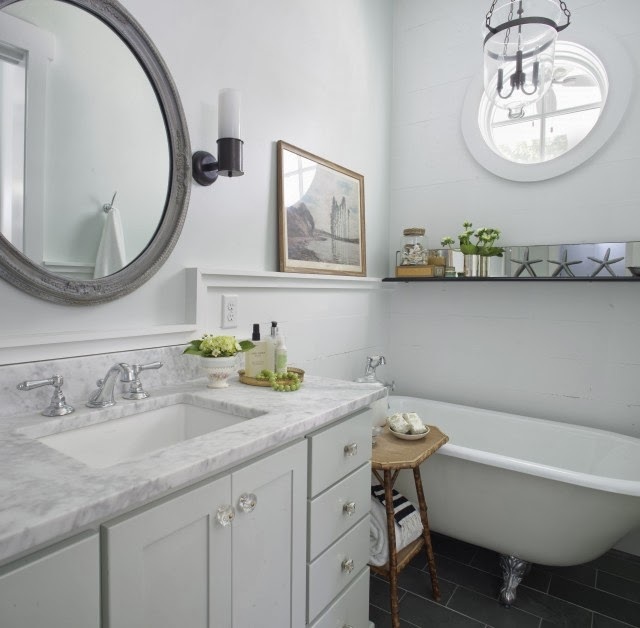 I think a simple white linen shower curtain pulled to one side would look perfect in this bathroom. It wouldn't compete with the gorgeous flamingo tiles and would match well with the old world feel of the floor tiles. 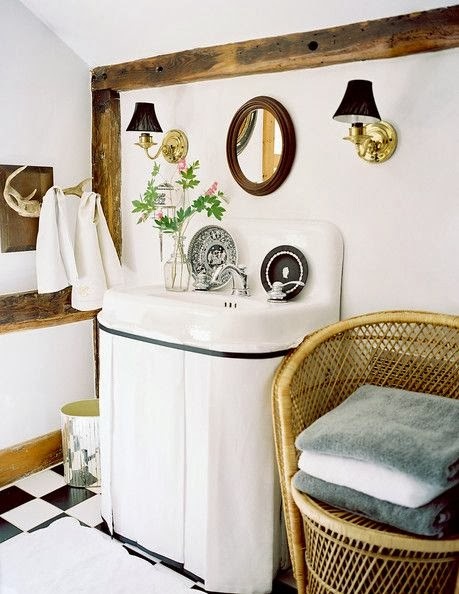 A simple linen shower curtain would also add some texture to the bathroom. A clear plastic shower curtain could also work, but I think it would look too sterile with the traditional shower fixtures. Makes me think of an old hospital shower, yuck! If the shower fixtures were more modern a clear plastic shower curtain would probably be ok. Otherwise, I might go for a pale grey/blue plain shower curtain or a white one with a 1 inch black trim down the side. 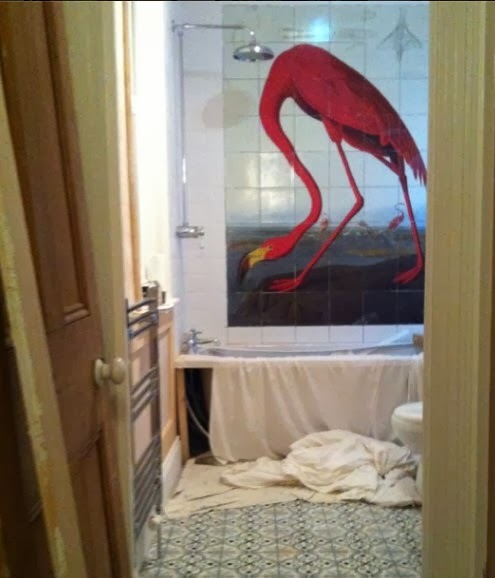 I'd hate to see this flamingo hidden behind a shower curtain all day! Oh and it's probably sacrilege to paint over such nice wood, but I think I'd paint the door white too. 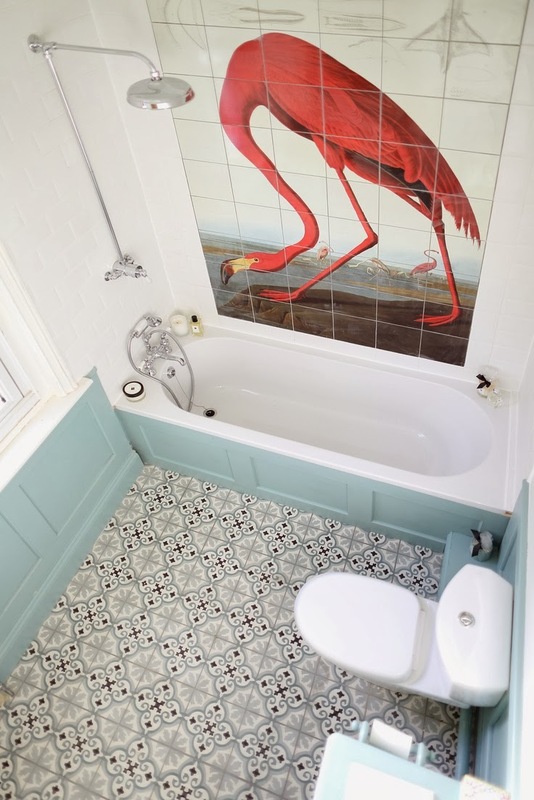 Now I don't want to end on a sour note, I think this bathroom is a stunner! 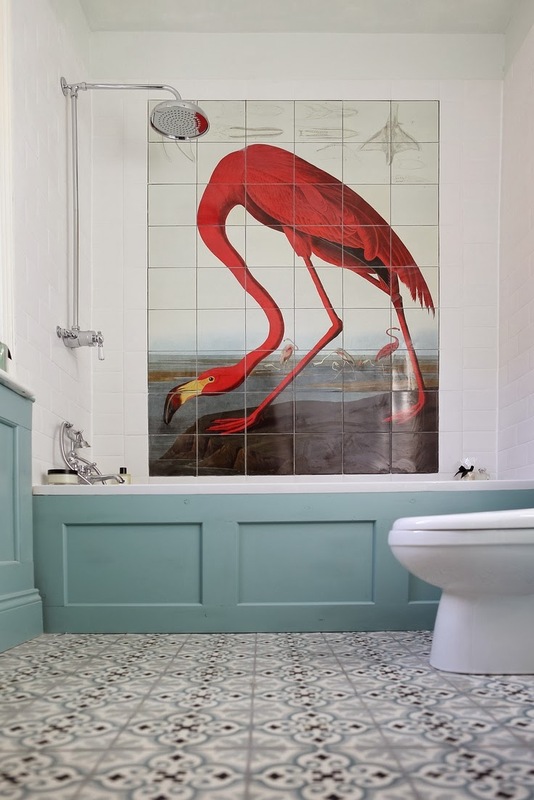 The flamingo tile mural is perfection and anyone would be lucky to have such a pretty bathroom.